2018 is finally here and we are already excited to see what it has in store for us. 2017 was another record breaking year and we are happy and grateful for all the support we get from disc golfers around the world. This support means that we, in turn, can support players and tournaments on all levels. Of course having our own Ricky Wysocki defend his position as the PDGA World Champion was the highlight on the high end of competition. It is also with great appreciation and enjoyment we read and hear about our team players hosting clinics and small one day tournaments, which gathers lots of new players trying out the sport, and school activities that we have supported in different ways. Seeing someone hit their first ace or even just make the first drive they are happy with never gets old. Working with Jeremy Rusco and the staff at Dynamic Discs is always an amazing experience. This year we brought our forces together even more by jointly acquiring Westside Discs in order to make the Trilogy family even stronger by putting new efforts behind that brand’s growth. We have already received great news on the development in the USA and look forward to continued progress with our American friends. 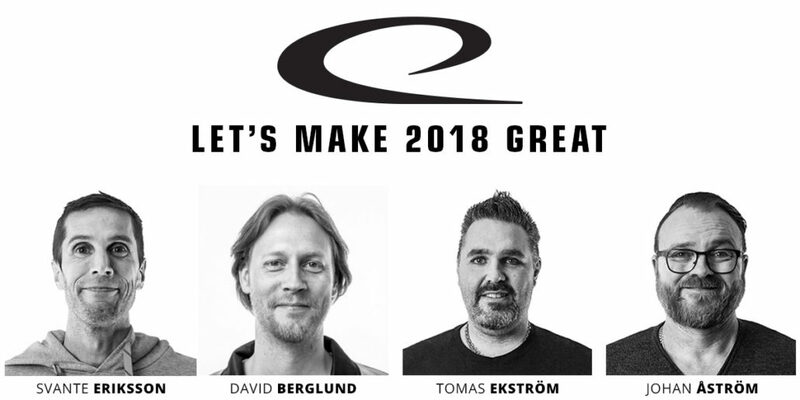 In Europe the Westside warehouse closing down in Finland and us expanding the Latitude 64 facility size by 50% will mean that there is a bigger than ever selection of colours and weights in all molds available to all European customers. In order to keep everything in order we hired long time disc golfer Emil Burstrand as the European Sales Manager. Two of Westside’s former staff members has joined the new and improved Latitude 64 organisation. Teemu Nissinen will be handling Finnish customers and marketing as well as taking care of course design projects in Finland. Teemu Mutikainen has moved to Skellefteå and been welcomed into the disc production crew. OK, enough of the looking back. In 2018 we will introduce the Ballista Pro, Explorer, Fuji, and Saxon. The Ballista Pro is a more overstable Ballista which will provide a more predictable flight in all conditions. The Explorer is going to be the signature disc of Ricky Wysocki and the most reliable stable fairway driver in our lineup for players that throw with maximum power. The Fuji will be an overstable midrange that utilizes the overmold (2K) technology and released in April around the Glass Blown Open. The Saxon will be an overmold (2K) fairway driver for the Trilogy Challenge. Dynamic Discs will release the Captain, Maverick, Getaway, and Patrol to the Dynamic Discs family. The Captain will be a high-speed driver that you can count on to get maximum distance. The Maverick is a slightly understable fairway driver that will not disappoint. The Getaway is a reliable fairway driver that is the big brother to the popular Escape. The Patrol will be introduced for the Trilogy Challenge and is DD’s most understable midrange in max weight. Westside Discs will introduce the Anvil, Warhorse, and Maiden. The Anvil is the most overstable midrange in the Westside lineup with similar flight characteristics as the Justice. The Warhorse is an overstable wide-rim driver similar to the Enforcer. The Maiden is the Trilogy Challenge putter that has a very neutral flight and feels great in the hand. The Latitude 64 baskets are finally coming to America! This has been a long process and we have had countless questions on this matter for the past 5 years. This spring you will able to get our baskets from Dynamic Discs along with all our other products. There is a good chance that the first batch will run out, so get your order in asap if you are interested. Another project that has been in the works for a long time is our disc golf course design concept Disc Golf Solution. We will post more on this on discgolfsolution.com shortly. No matter what your needs are; fixing up an old course to make it safe and up to date, or building one from scratch, we will help you reach your goals and make your community excited to come and play. Burst is another thing that saw daylight during the end of 2017 and will be offered in more molds during 2018. This has been very well received and we have worked hard to keep up with the demand. Many players wants something that stands out visually and these discs sure meets that requirement, in that every single disc has it’s own unique burst pattern and color scheme. Team Fundraiser Discs will be available for our top team players and sold through l64custom.com. Check out these special creations during 2018 and find molds, plastics and color stamps in a combination that is not found in our basic lineup. 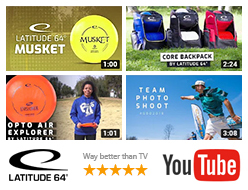 While getting yourself a special collectors disc you will also support Latitude 64 players in their efforts to be full time pro’s. Next Generation Tour Series will make a strong comeback in 2018 with more great deals and prizes, while offering amateurs all around the USA an opportunity to duel and show who’s the best. More info to come at nextgendiscgolf.com. Working closely with Dynamic Discs also means that we have been a part of the Glass Blown Open for several years running. This will continue during 2018 and we are excited that the field will be 1600 strong, and with more on the waiting list in case a spot opens up! As always we will be present and look forward to seeing old friends and making new ones. Another tournament, closer to home, where we will be present is the 2018 Tyyni. With an estimated field of more than 600 competitors, Dynamic Discs, Latitude 64, and Westside Discs are all proud to be the presenting sponsors. Even closer than that, in our back yard, we will be present (and also sponsor) the 2018 Skellefteå Open, a EuroPro Tour event. The tournament will be held 6-8 July at Discgolf Terminalen in Skellefteå, Sweden. The registration will open up 1st of February 2018. More info will be available soon at www.sodiscgolf.com.